London, The Arab Weekly – Jeremy Corbyn promised a new kind of politics as he took over Britain’s main op­position party, seeking to revitalise Labour after a dis­astrous performance during the general election in June. Seen as a longshot to win election to head his party, Corbyn succeeded in becoming the Labour Party lead­er with a message of “change” that captured popular interest. Tens of thousands of disenchanted voters returned to the party or joined for the first time to vote for him. Corbyn swept into office on Sep­tember 12th with a massive popular mandate, winning nearly 59.9% of first-preference votes. The 66-year-old is the oldest leader of a major UK political party in 35 years and has a reputation as a rebel, voting against his own party leadership more than 500 times since being elected to parliament in 1983. “During this amazing three months our party has changed. We have grown enormously; we have grown enormously because of the hopes of so many ordinary people for a different Britain, a better Brit­ain, a more equal Britain, a more decent Britain. They are fed up with the inequality, the injustice, the un­necessary poverty; all those issues have brought people in, in a spirit of hope and optimism,” he said in his election speech. Immediately showing the kind of party leader he plans to be, Corbyn, a vocal critic of Britain’s refugee policy, left the podium to attend a “Solidarity with Refugees” rally in London. “Corbyn has been a friend of the Muslim community for decades. He has very good ties with all sec­tions of the Muslim community and he’s paid for it, especially his advo­cacy for the Palestinians against Israel. He’s been subject to a lot of smear attacks because of that,” said Roshan Muhammed Salih, editor of British Muslim news website 5Pil­lars. Corbyn comes into office at a time when British Prime Minister David Cameron is considering air strikes in Syria, facing a major refugee crisis as a result of conflict in the Middle East and seeking to renegotiate Brit­ain’s membership in the European Union. But Corbyn and Labour face a tough task heading off the Conserv­ative government, which enjoys a strong majority in parliament, with questions remaining as to whether the new party leader — an arch lib­eral — will seek to direct the party left or moderate his views. Corbyn has famously called for dismantling Britain’s Trident nuclear missile system as well as for wanting the United Kingdom to leave NATO, a stance his deputy Tom Watson op­poses. Corbyn named his shadow cabi­net on September 14th, appoint­ing defeated leadership candidate Andy Burnham as shadow home secretary. His decision to appoint left-wing MP John McDonnell as shadow chancellor was met with discontent in some corners of the party. Corbyn’s election is expected to have major repercussions on Brit­ish domestic policy but his foreign policy views are also well known and many analysts expect him to challenge Cameron on a number of issues. “One of the first big foreign pol­icy tests in the Commons will be the government’s planned vote on [Royal Air Force] air strikes in Syria. Again, it is hard to envisage Corbyn’s Labour doing anything other than voting against, given he has repeatedly said bombing will not help resolve the crisis,” Ewen MacAskill, defence and intelligence correspondent for Britain’s Guard­ian, wrote in the newspaper. “It is clear that the prime minister will soon again be asking us to bomb Syria. 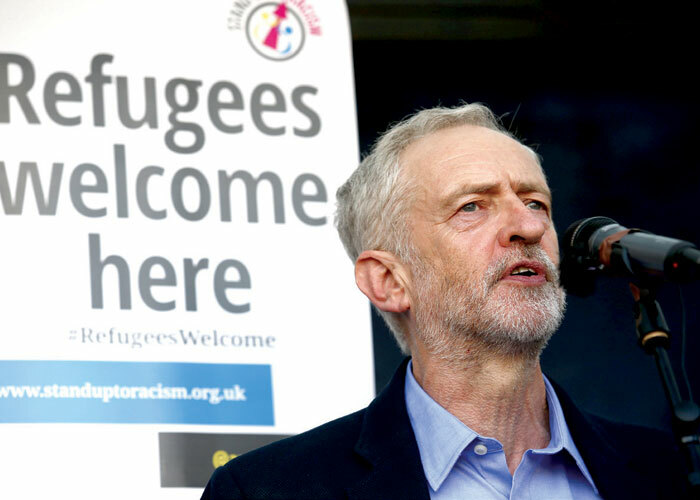 That won’t help refugees; it will create more,” Corbyn warned on his second day as Labour leader. Cameron, pointing to Corbyn’s anti-war sensibilities, claimed on September 13th on Twitter, “the Labour Party is now a threat to our national security, our economic se­curity and your family’s security”. Defence Secretary Michael Fallon and Justice Secretary Michael Gove repeated the warning, indicating a stance that will likely be a key part of the Conservative party’s strategy on how to deal with Corbyn.